The show opens Friday, Jan. 20 and runs through Saturday, Feb. 4. Performances are scheduled to take place on the CenterStage at the Reston Community Center at Hunters Woods (2310 Colts Neck Road). 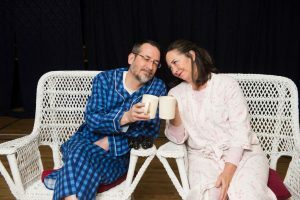 The play, written by Christopher Durang, centers around Vanya and Sonia, middle-aged siblings who live happily together in rural Pennsylvania. But when their other sister, a B-list Hollywood star named Masha, shows up unexpectedly with her latest boyfriend, Spike, she tries to draw them into a kooky plan that inevitably upends their previously quiet life. The modern comedy is based upon a 19th-century Russian play, “Uncle Vanya” by Anton Chekhov. In his play, Durang takes the classic tale and weaves it into a work of American pop culture that aims to bring laughter from audiences of all ages. The cast of the Reston production includes Andrew JM Regiec as Vanya, Lee Slivka as Sonia, Joanne Maylone as Masha and Will MacLeod as Spike. The production is directed by Tel Monks, and it is produced by Bea and Jerry Morse. Evening performances of “Vanya and Sonia and Masha and Spike” are set to take place Jan. 20, 21, 27 and 28, and Feb. 3 and 4, at 8 p.m. A matinee performance is scheduled for Sunday, Jan. 29 at 2 p.m. The production is one of several celebrating Reston Community Players’ 50th season. “Gypsy” was performed earlier this season, while later productions will include “Rock of Ages” (March 10-April 1) and “Private Lives” (May 5-20). Tickets are $21 for adults, and $18 for seniors and students with ID. Tickets can be purchased online or by calling the CenterStage Box Office at 703-476-4500, ext. 3. For more information on this and other shows, visit the Reston Community Players website.